Organic natural Perfumes are subtle and healthy Made in Australia by a talented perfumer. Using only organic essential oils, made from flowers and plants. Natural and organic perfumes are deep & complex, yet subtle and healthy. Outside packaging uses recycled cardboard and perfumes are housed in quality glass bottles. Each kind has an original artwork created for Kis My Body by wellknown Melbourne based artist. 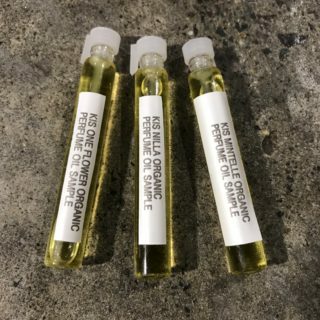 Available in Eau de Pafum (organic sugar cane alcohol) or alcohol-free perfume oil (organic jojoba oil).